We need more games like 0RBITALIS. For many companies, “casual gamer” is synonymous with “ignorant customer.” While that’s not necessarily incorrect, it should not be an excuse to exploit them with tidal waves of derivative match-three Skinner boxes. 0RBITALIS (presumably named so that it will appear at the top of any alphabetical lists) is a rare, highly original casual game that doesn’t treat its audience like easily distracted children. That doesn’t make it a great game – it’s got a completely broken challenge level and some technical issues – but it does make it a respectable one. 0RBITALIS is an undeniably relaxing experience. The main controls are limited to the mouse, which is used only briefly to determine the initial trajectory of an artificial satellite. After that, the game becomes primarily about waiting, as the most common goal of each level is to have the satellite survive a given amount of time after launch, ideally by setting it on a stable orbit. Spending 90% of the gameplay doing essentially nothing sounds awful, but watching the elegant, looping patterns of the satellite’s motion unfold is a surprisingly mesmerizing activity. It does get old when the trial-and-error nature of the mechanic kicks in, and the same satellite has been launched a dozen times without success. Which brings me to the factor that ultimately prevents 0RBITALIS from achieving greatness: physics. It is utterly impossible to predict the satellite’s trajectory beyond the first second of its flight. With some levels’ survival goals clocking in at upwards of 20 seconds, much of the game is essentially a die roll. The only amenity for countering this is the ability to see clusters of other players’ launch positions. It’s a neat idea, but because there are so many variables involved, and slight differences can have enormous effects, it has the same probability of being useful as the player messages from Dark Souls. In fact, the game itself predicts the events of each launch to at least some extent, and the calculations required to do so are so complex (we’re talking extremely accurate depictions of advanced physics on a massive scale) that they can actually slow down the game on a mid-range system. Or at least, mathematical complexity is my educated guess for what’s behind the slight choppiness 0RBITALIS exhibits. It’s certainly not graphical complexity, as the visuals are essentially programmer art: geometric objects with types denoted by their number of sides. There is a “quality” setting, but it only adds layers of distortion, simple lighting, and other unnecessary details. 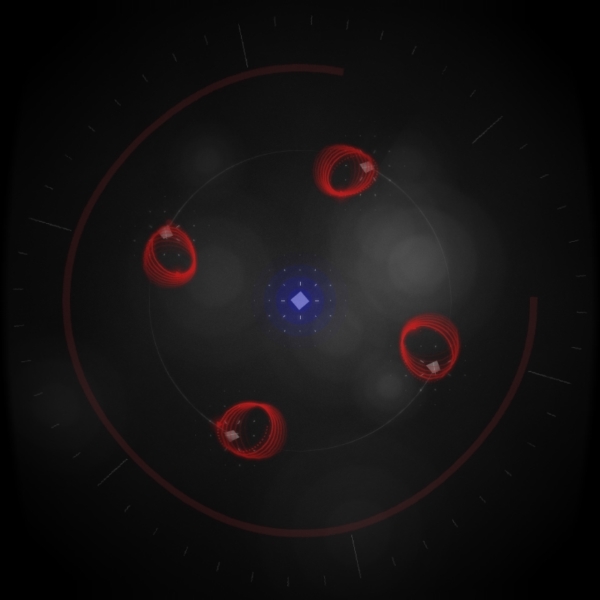 The higher settings also cause the satellite’s trajectory indicator to flicker – a distracting bug that disrupts the mood of the game. Despite its shaky performance, 0RBITALIS is an aesthetic experience at heart. It’s about the simple joy of forming a striking composition using nothing but an equation and a mouse click. As such, its minimalism is a great asset; additional details would only distract from its quiet beauty. Speaking of quiet, the game’s sound designer is credited for the “audio experience,” and it’s easy to see why. The game’s soundtrack is an ambient tour de force, one that screams “science fiction” and adeptly complements the gameplay’s trance-inducing quality. The sound effects are built from the same mold, but they hit their mark less often. In particular, the “stage complete” sound doesn’t really convey “success,” although that could be intentional, to keep players focused on playing the game, not just beating it. It’s not unlikely for something like that to be intentional, because 0RBITALIS is a well-designed game, unstable difficulty level notwithstanding. Levels are arranged into sectors, each of which introduces a new mechanic to the game’s ever-expanding stable. These begin with simple additions like hazardous orbiting debris before evolving to include multiple satellites, wormholes, and stars whose “gravity” repels instead of attracts. The more esoteric puzzles are confined to optional challenge levels, which seems an odd choice at first, given that they comprise at least a third of the total running time. It makes sense though, because their segregation ensures that the core levels don’t drag on too long, while allowing additional content to be present for any players that want it. A level editor, daily challenges, and online leaderboards round out the game’s features, although the value of the latter is fairly dubious. With so much of the gameplay based on chance and patience, the leaderboards essentially become rankings of who has the most free time. The level editor is much more appropriate. Its unorthodox blueprint-style interface isn’t especially intuitive, but it contains everything required to make interesting levels of all degrees of complexity. The daily challenge levels perform the same function as the regular optional challenges: extra content for devout fans that doesn’t get in the way of the main progression. 0RBITALIS succeeds at being much more accessible and artistic than most games where scientific accuracy is a core aspect of the gameplay. Unfortunately, complexity and artistic ability usually aren’t those games’ weaknesses; the unforgiving and uncooperative nature of reality is. 0RBITALIS’s solid design can’t save it from the fact that its gameplay is based on a task that a human can only do correctly if given precise numbers and a lot of time and scratch paper. The game is still not without merit – it’s frequently intriguing as an experience – but as a game, it’s an especially pretty die-rolling simulator. This will never be anyone’s favourite title, but it’s a riskless purchase for anyone who wishes that story-focused games had a little more gameplay to them.